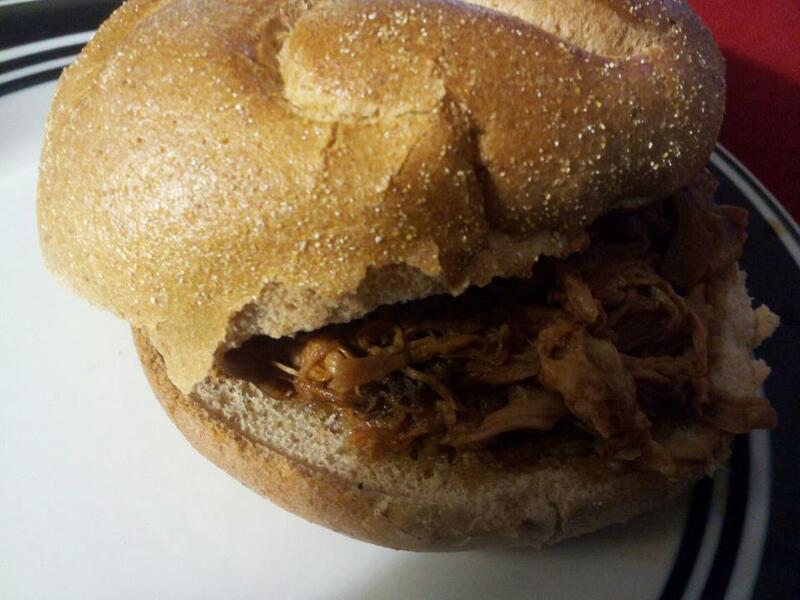 I’ve only made pulled pork once before, which is odd, considering how yummy and easy to make it is! Since putting together my “Recipe Binder,” I realized I have a ton of pulled pork recipes to choose from. It is so easy to throw in the crock pot. My husband gobbled up two sandwiches for dinner and I must admit, I did too. =X This recipe is slightly adapted from Stephanie O’Dea, one of the queens of crock pot and gluten-free cooking. -Trim meat and put in your crockpot [after all my recent experiences with pork, I have to say that trimming it is my LEAST FAVOURITE TASK. I find it so gross for some reason. I suppose I could pay an arm and a leg to have a butcher do it for me, but I’m too poor for that]. -Now, the recipe I used said to squeeze in the ketchup (which supposedly uses an entire bottle, depending on your bottle-size), and then put the warm water in the bottle, shake it, then pour the ketchup-y water into the crock pot. I did not do that (my bottle must have been bigger, and also I forgot). I just poured the ketchup and warm water into the crock pot separately. You can do whichever you prefer. -Cover and cook on low for 8+ hours. Shred the pork with a fork and serve over fancy buns.